Angie undertakes commissions scattered throughout the year between teaching commitments. 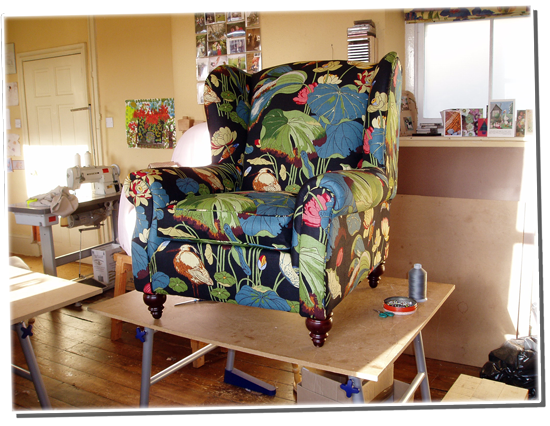 She makes all soft furnishing, from roman blinds to large interline hand pleated curtains, loose covers of all shapes and sizes and small (nothing larger than a very small 2 seater sofa) upholstery commissions. Please ring/email for more details. Higham Hall - twice a year in spring and early Autumn I teach at Higham Hall, near Cockermouth in Cumbria. They run a wide selections of courses throughout the year and it is a very beautiful location. If you are looking for somewhere to stay while attending a course, here is some bed and breakfast accommodation that students have recommended - _DeeleyHouse - this is a short drive away up the A6 towards Bakewell.